There were peaches in the store yesterday and I could not resist. I bought a bag and my kids suggested making cobbler. Why not. 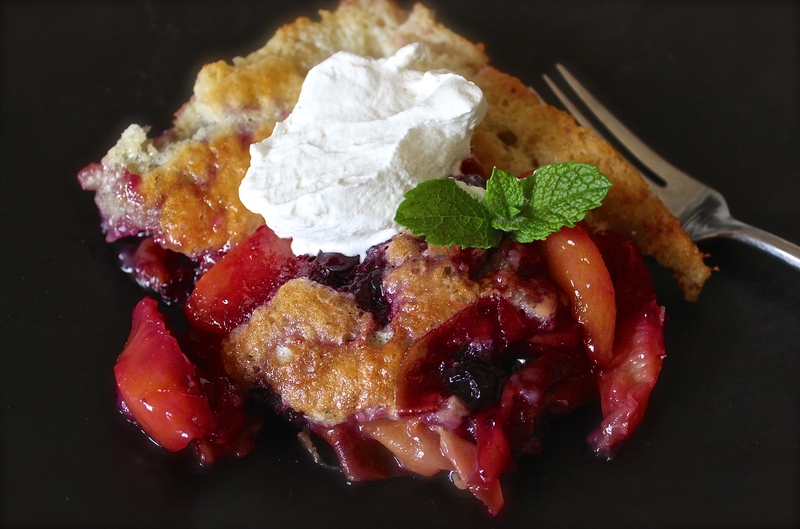 I cannot believe I’ve never made cobbler before. I didn’t even think I would enjoy it, but I did. A lot. Maybe a little too much so next time I will use less butter and sugar; maybe even half (I’ll update the recipe here if it works). But the kids licked the plate and definitely got a serving or two of fruit that is full of phytochemicals, which are beneficial in preventing diseases like macular degeneration, heart disease, and cancer. Preheat oven to 350 degrees. Combine peaches, blueberries, 1 cup sugar, and water in a pot. Bring to a boil and simmer for 10 minutes or until the liquid becomes syrupy. Place butter in a baking pan and place in oven to melt. Mix remaining 1 cup of sugar, flour, and milk. Pour mixture over melted butter. Do not stir. Spoon fruit on top and gently pour in the syrup. Bake for 30 minutes or until cake is set and top is golden. Whip cream with vanilla (and a sprinkle of sugar if you like it sweet). Serve on top of cobbler. On day 80 of this 365 day project, I ate my daily five (including some of our home grown kale, which is so easy to grow and will ensure that I make more of these kale cookies). Did you enjoy yours?